How Franchises Can Add Local Involvement to Their Facebook Advertising | Reshift Media Inc.
Facebook is a tremendous advertising opportunity for almost any business. The depth of geographic, demographic and interest-based targeting is unmatched by ay other advertising medium. 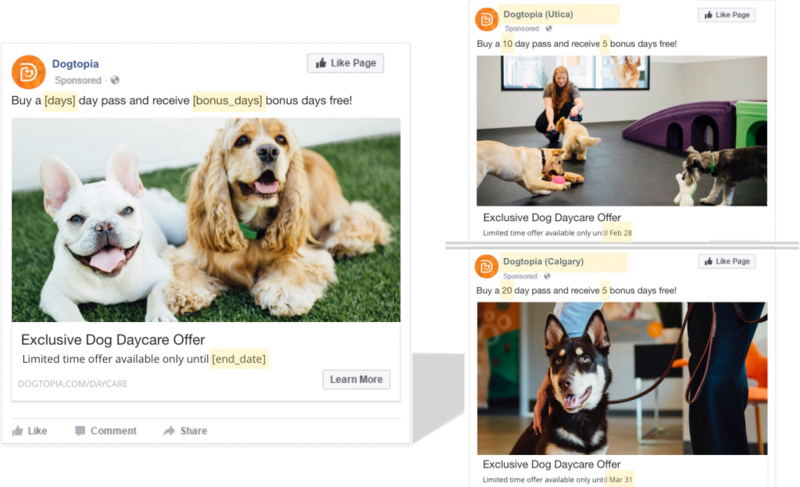 As we discussed in the previous article in this series, there are several very powerful Facebook opportunities that multi-location businesses should consider as part of their social advertising strategy. 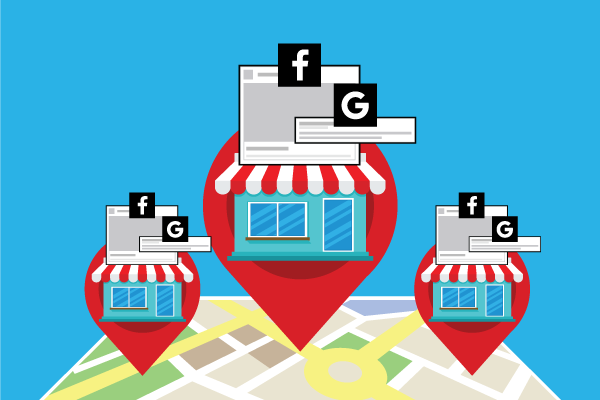 However, although the Facebook features we reviewed are certainly a step forward for franchise companies, they don’t really take advantage of the local power inherent to a multi-location business. In this article, we discuss how franchise companies leverage their Facebook advertising to generate better clickthroughs, lower CPCs and more leads. 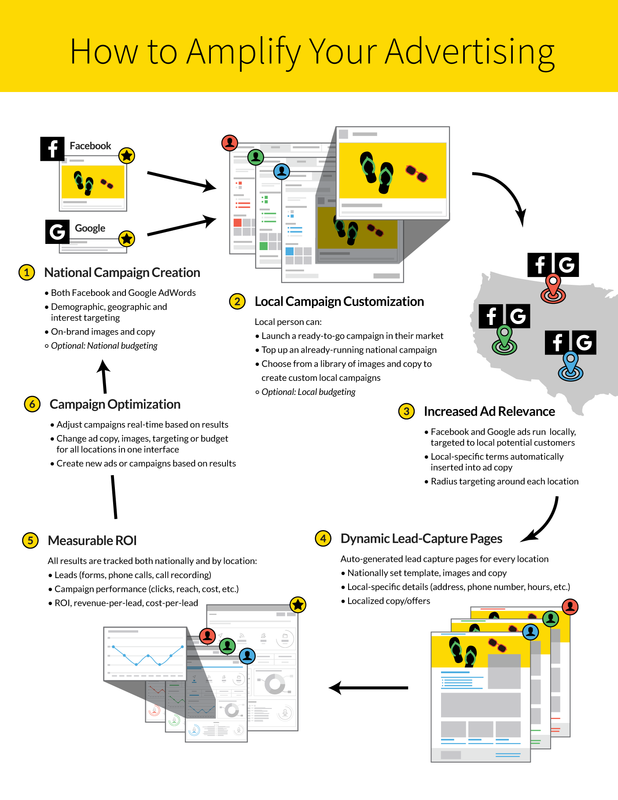 Why use local social media and adwords advertising? Before we discuss how to take advantage of local social media advertising, let’s first discuss why local is so important. Local is a part of every franchise system because the company is essentially made up of a group of local entrepreneurs, each running their own business under a common brand managed by the franchisor. As we discussed in our previous article, this creates a natural tension within the organization between national consistency/cost-efficiency and local independence/innovation. In high-functioning organizations, this tension can be used to produce truly superior digital marketing results. Beyond the natural “localness” of the company, there are many other digital marketing advantages that make a local strategy attractive. Having worked with multi-location businesses around the world, we have seen many organizations employ both a “centralized” and “localized” approach. In general, the local approach tends to perform much better when comparing clickthrough rates, cost-per-click and cost per lead/conversion. The national ad clicks through to a common landing page/website for all locations – same copy, images, etc. The local ad clicks through to a landing page which is unique to that location – address, phone number, images, services, staff, etc. As outlined above, there are many advantages to a local marketing strategy. Intuitively it makes sense – local ads, landing pages, offers, etc. have more relevance to people and they therefore tend to encourage people to respond to the advertisements more frequently. In addition, Facebook is increasingly weighting local relevance as a factor in deciding what content (including advertising) to show to people. Facebook knows that local sells, and they are in the business to make money. 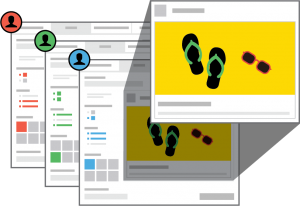 So the better your ads work, the more Facebook will tend to show them – and local relevance is a growing factor in that algorithm. Get a free demo of our Brand Amplifier software! We have yet to meet a franchise company that doesn’t believe that local is a major key to success. Where they usually have a challenge is in achieving local strategies at scale. The whole concept of a franchise is to implement proven processes across a large number of locations, so a local strategy does not seem to make sense, as it usually does not scale. Many franchise systems attempt to implement a hybrid national/local strategy by throwing people at it, but this tends to be a costly and time-consuming endeavour. The solution is to automate the process. Through software, a franchise system is able to achieve the best of both worlds: national consistency and scale combined with local relevance and results. 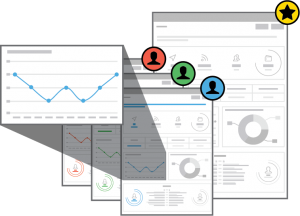 To achieve this objective, we at Reshift built the Brand Amplifier ad syndication dashboard. 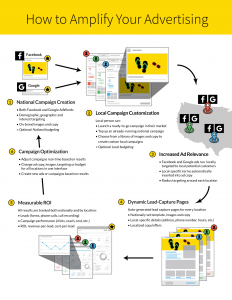 The software is integrated with both Facebook and Google to allow franchise organizations to create, cascade, manage and measure social and search ads across dozens, hundreds or even thousands of locations. “Master” ad: Come visit us at [address] before [date] and receive [offer]! Location 1 version: Come visit us at 123 Home Street before January 5th and receive 10% off! Location 2 version: Come visit us at 456 Elm Avenue before January 31st and receive a free sample!Note that although the ad is created once, it is run on the local Facebook pages of each of the franchisees’ locations in order to increase the “localness” and drive new business for each specific location. Geographic and interest-based targeting can all be set programmatically as well. Create an ad program which includes several on-brand photos and sets of copy which the local franchisee can choose from. If desired, the sets of copy can even contain flexible parameters to enable greater localization. In this approach, the head office ensures the creative (photos, video, copy) is all on-brand and properly formatted, while the franchisee has the flexibility to choose the photo and copy that works best for their own market. This is really the best of both worlds, because the creative produced by head office can be used at scale and the franchisee can apply local market intelligence to increase ad performance. One of the big benefits of a localized approach is that it allows franchise companies to unlock local ad dollars to increase performance. Most franchisees are already advertising locally in some form – mailers, flyers, newspaper, radio or digital. However, in most cases the local and head office efforts (and therefore ad dollars) are not as aligned as they could be, which leads to less effective results for everybody. In some cases we have found that the head office and local teams are working at cross purposes, which is not a good use of time or money. All three models are supported, as each franchise system is different. Where it is feasible, we have found option #3 to be quite effective, as it combines best-in class creative, national budgeting and local budgeting together to provide the best chance for success. For more information about the Brand Amplifier we encourage you to visit www.brandamplifier.io, or you can arrange a free demo.